This is part one of what I am sure will be many, many blog posts about the winter weather here in central New York. Wednesday, October 29th was the first snow of the season in my area. I had heard reports about icy and snowy precipitation in town a week or so ago, but we had not had any wintery precipitation until Wednesday. We had a very light snow all day long, but it didn't accumulate much because we have only had a few nights when the temperature got below freezing. You might have to click on the pictures to enlarge them if you want to see the snow. 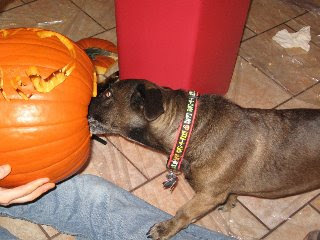 Last Saturday, we had the Fourth Annual Pumpkin Carving Party at my house. Six people + one dog + seven pumpkins + lots of knives and saws + wine and Moroccan cocktails + champagne cheddar cheese + Tastes Like Halloween = Awesome. We only had one bloody injury (sustained by the one person who wasn't drinking anything alcoholic) and McKenna ate approximately 16.7 ounces of pumpkin entrails and seeds off of the floor and one slice of cheese. All in all, it was a successful evening. Thanks to Jessica, Emily, and Aaron for providing additional photos. 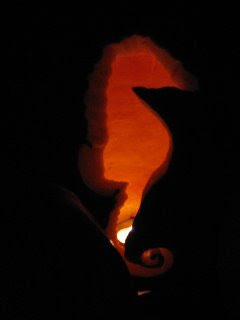 I carved a seahorse and McKenna decided to carve two paw prints--ours are on the far left of this picture. 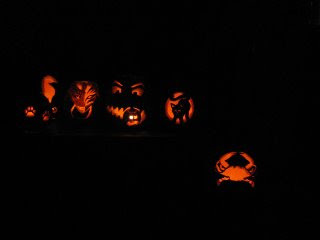 Next to ours is Jessica's favorite TV character, then Frances and Manuel's large scary pumpkin eating a smaller, scared pumpkin, Emily's black cat, and Aaron's crab. And even tonight, he looks pretty good. I haven't noticed any significant signs of rotting yet. Since I'm working from home right now, McKenna and I have developed a new routine. At first, she tries to be helpful by contemplating hauling books upstairs. Then she remembers that she doesn't haul things. 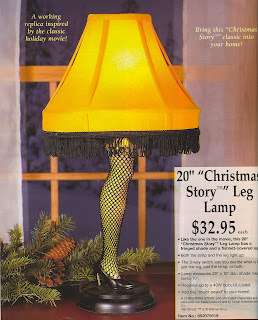 Since the holiday season is quickly approaching, I have been receiving a record number of catalogs addressed to the previous resident of this house, Mrs. Disgustington. You may remember from my previous "Do They Know It's Christmas?" 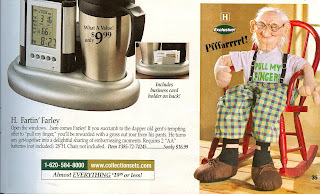 post that these catalogs are filled with some interesting gift ideas, holiday decorations, and home decor. 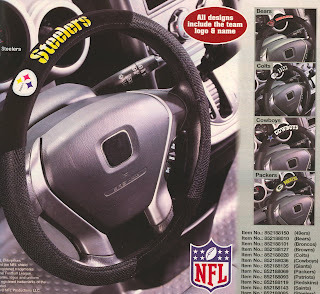 Being in possession of these catalogs, I feel that it is my duty to share some of the possibilities with you gentle readers who may not otherwise be aware of them. 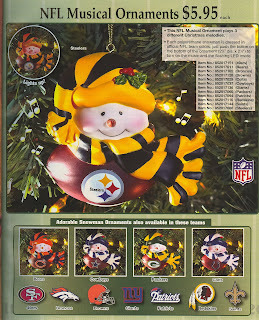 Trim your tree with one of these--they are even musical! 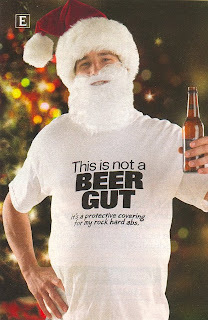 Perhaps you could pair the beer gut t-shirt with these lounge pants for an extra special gift. 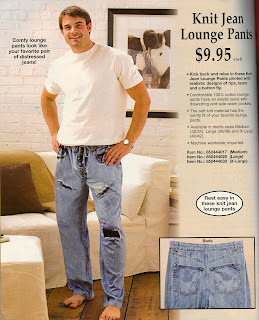 There is just something fundamentally wrong about making lounge pants that look like worn out jeans--what is the point? I seem to recall a similar knit-pants-made-to-look-like-jeans product that someone marketed for about five minutes in 1987. It didn't work then and I doubt it will work now. And now for some Christmas themed products. 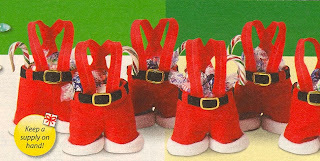 First, I have seen these Santa pants candy bags in at least two other catalogs. Who wants to eat candy out of Santa's pants? I love these themed bathroom rugs. 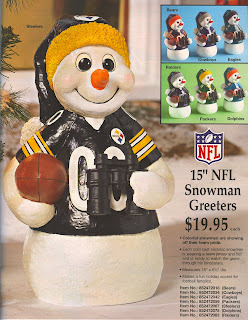 I see them in these catalogs all of the time for various holidays. 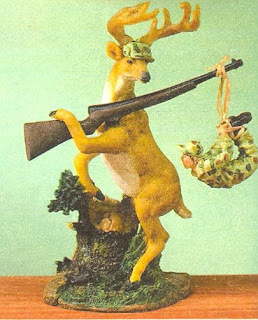 The Christmas ones are the best, though, and this example of Santa and a chimney-that-serves-as-a-tissue-holder is something else. 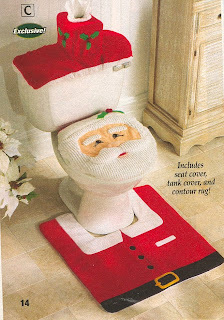 I once saw one that made it look like Santa had fallen head first into the toilet. 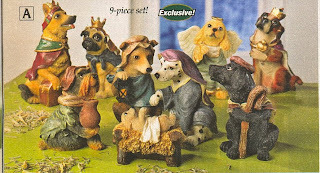 Here we have another "exclusive" item: the dog themed Nativity set. 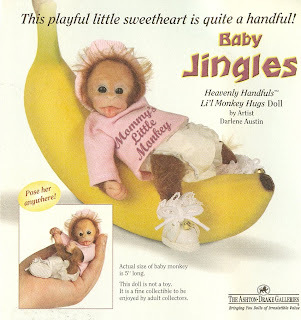 I think I would have used a Chihuahua to play the baby Jesus. This next item--what do I say about this? I am considering it as a gift for someone I know who collects cow themed items. I am sure that she needs a new vacuum cover. 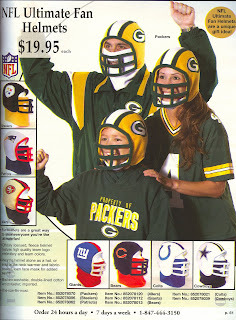 If you've been shopping for a dickie for you or for a loved one, look no further. 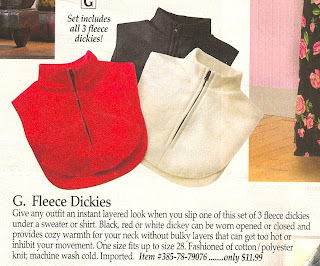 These are even fleece! 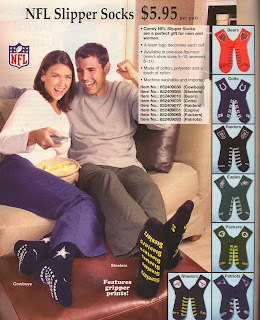 I don't understand the point of these, particularly not in fleece. These things are so creepy. 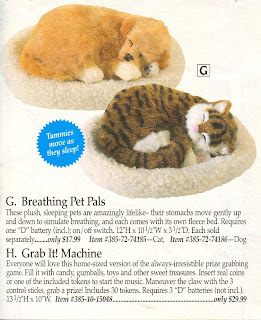 I was in a store once where someone had one of these on the counter and I thought it was real. 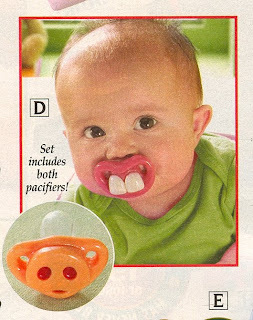 The baby versions are even creepier. What is this all about? Who is buying these things? What does one do with them? Okay, so it isn't a real 80s song, but it is the best thing about the otherwise terrible movie "Music and Lyrics," in which it plays an 80s song. Besides apples, apple cider, and cheddar cheese, one of my other favorite fall foods is Tastes Like Halloween, so named by my college friends. I probably make at least 8 pans of this during the fall for various people and events and people always love them, so I thought I would share the recipe and process with all of you gentle readers. As they get to this point, I get started on the topping. When you're done, it will look like this and you can pour it into a greased 13 x 9 pan. I did a lot of this while I was on the phone with Brother of Ken--it is hard to talk on the phone and deal with caramel! Once the cereal and caramel mixture is in the pan, I dampen my fingertips with water and press it into an even layer. The water keeps the caramel from sticking to my fingers. See? Halloween colors and fall flavors = Tastes Like Halloween. This recipe came from my mom, who probably got it out of a magazine when Brother of Ken and I were much younger. I hope you enjoy it as much as we do.